Wishing Joseph Duggar a very happy 24th birthday! 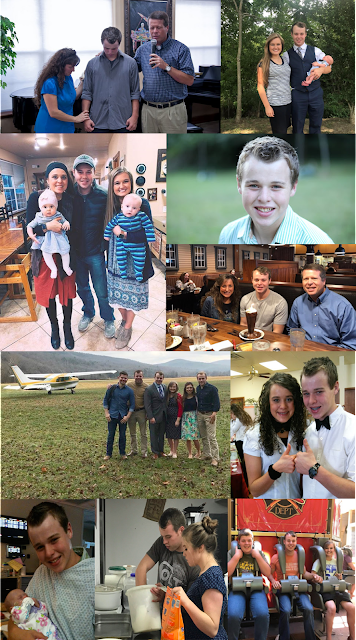 Joe is a brother to 18 siblings, husband to Kendra (Caldwell) Duggar (married 16 months), and father to Garrett David Duggar (seven months old). Happy 24th bday Joseph your a great dad & best husband. Your son Garrett would someday pick a woman the will look like his momma. Have a great wonderful B-DAY YEAH. Happy birthday! May God bless you! HAPPY B-DAY, TO MY 3ND FAVOURITE DUGGAR, U HAVE A WONDERFUL FAMILY, AND I LOVE YOUR LITTLE BOY!!!!!! Happy birthday Joseph! May God Bless you and your beautiful family! Why do some people keep pushing babies on these young marrieds? They already are bombarded with changed all within one year of meeting each other. Quit pushing them through life. Wish them a happy birthday and leave it at that. @ 2:54 I think they push it on themselves, too. Get married quickly, get married young, don't use birth control, and these things happen. A lot. What do you mean "change within one year of meeting each other?" Which one of the married couples knew each other less than a year before getting married? Their courtships and engagements have been short, but they've known each other for at least a year. Besides, I married my husband 11 months after we met and it will be 25 years this May. Happy birthday 🎂 to you, Joseph! The Duggars are all about having babies! That is the whole premise of their show--remember the family with 19 children? Remember the wedding vows to have as many children as God gives them? 12:12 jinger and Jeremy certainly used some some form of birth control. Knowing each other as friends and knowing each other romantically is completely different. I don't see anyone pushing them to have babies in the comment section. Having children is their choice. They are married, so what's the problem? You can't control people. You live your life the way you want, and they will live life the way they want. 3:43- No way for you to know that. Not everyone conceives right off the bat, even without contraception. Every body is different. I think the choice is theirs if they want to have children. There's only two in their relationship, not three. It's weird how people get mad that these people don't wait a while after marriage before having children. They act like they are part of the relationship. If you want to wait, fine. If they don't want to wait, it's their choice. Joe, such a solid guy & great brother; sure to be a great husband & father, too! May God abundantly bless you! Happy Birthday to you! I had some ideas from watching the Duggar Family. I think it would be great to see Jana/Jill do a YouTube show to help women that are expecting a baby, how to eat/take care of themselves, etc. Maybe call it "Healthy Start with Jana and Jill". Since they are mid-wives. There are first time Moms who do not understand or know what to do. This could help them. Also, Jessa loves to decorate. Maybe she could do a show to help people decorate. The show could be, "Designs by Jessa". There is so much talent in the Duggar Family that could help other people. I hope you think about it.